My wonderful Lemon bars are easy to make and a big hit with everyone. Blend butter, 2 cups flour and 1/2 cup confectioners’ sugar until a smooth paste. Press into ungreased 9″x13″ baking pan. Bake for 18 to 20 minutes. Or until set not brown. Beat together eggs, sugar, 4 tablespoons flour, and lemon juice until light and frothy. Pour over hot shell sprinkle with lemon zest. Return to oven – bake at 325° for 20 minutes. While hot dust with powdered sugar. Cool, cut into bars. Oooh, I like the sound of these bars! I’ll have to try them soon. Thanks for participating in my Favorite Ingredients Friday- 4th of July Edition recipe exchange! I do appreciate it. Mmmm…lemon bars…do egg substitute (egg beaters or the like) work? No clue on the egg substitute; I haven’t ever used them. The top layer is like a custard so if the egg substitute will set up then it should work just fine. I suppose if you wanted to get creative you might try some knox to help it set if the egg substitute didn’t hold. Oh the other important tip: Don’t overcook the shell. If you make sure to take it out when it is just set firm and still pale it will be beautiful brown when the lemon layer sets. You can tell the lemon layer is done when the top is just starting to turn the lightest brown. I’ve never made lemon bars, but I love to eat them. I’m going to give these a try! These look delish! My husband just loves lemon bars. I will need to make these for dessert. 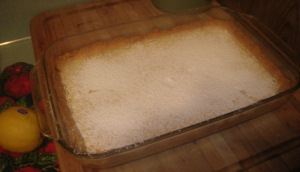 You are currently reading My Lemon Bars at Simply Catholic.